You've probably had a picnic in the park, but have you ever had the park as a picnic? Loomstate is kicking off our summer NYC Urban Field Guide series in Prospect Park this Sunday! 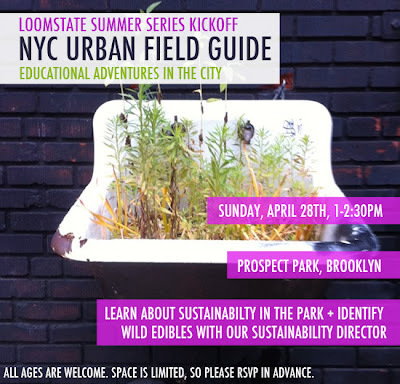 Loomstate's Sustainability Director and expert urban naturalist will guide you through the park, identifying edible plants along the way. Each attendee will get some Loomstate goodies and a starter kit for growing your own organic cotton plant at home! Plus, we'll show you how to turn cotton into thread. Space is limited to please RSVP in advance - rsvp@rogannyc.com.